When measuring for width, always measure the curtain track or pole width, not the window. 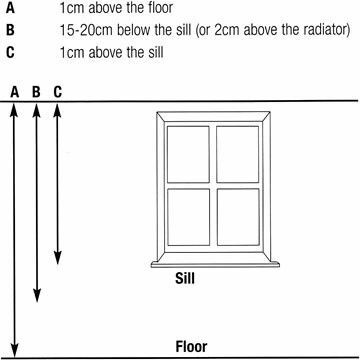 If fitting a new track or pole, we recommend that this should extend 15cm to 30cm either side of the window (to allow the curtains to be stacked back off the window) and 12cm to 15cm above the window recess. Do you have a centre overlap? If you have a rail with a centre overlap measure the rail as above and then measure the overlap and add the two measurements together. After measuring, simply look up your track pole width on the curtain ticket to find the recommended curtain width. For tabtop headings please refer to the tabtop information hanger. For pencil pleat headings, measure from the underside of the decorative ring to where you want the curtain to finish. Measure from the top of the track to where the curtain is to finish. All straight valances are 36cm deep, all shaped valances are 46cm at the outer edge rising up to 30cm in the centre. Use the valance rail width (not the curtain track width) to determine the size of valance required. This is normally approximately 30cm wider than the curtain rail is fitted to, due to the returns on either end. See diagram for details. All the Tab Top headings have 10cm long tabs which are included in the curtain drop This heading is suitable for poles up to 45mm in diameter. Measure from the top of the pole to where you want the curtains to finish. The eyelet will fit poles up to 38mm in diameter with the inner edge of the eyelet set down 3cm from the top of the curtain. Measure from the top of the pole to where you want the curtains to finish and add 3cm. Don't get stuck on a project, call The Fabric Shop Ltd on 0800 066 3973 for free and we'll give you all the advice you need!